Trail Tech is an industry leader in dirt bike hard parts, including kickstands, exhaust flanges, radiator guards, chainsaw mounts and flywheel stator kits for running LED or halogen lights. Converting motocross bikes to enduro, adventure or dual-sport bikes led Trail Tech to develop digital hour meters and more comprehensive multi-meters, such as the Striker, Vapor, Endurance II, GPS-equipped Voyager and compact TTO (tachometer, temperature or voltage). We installed the Voyager Moto GPS on a Yamaha YFZ450R for our January 2013 issue, and we also installed it on a Polaris RZR 570. While a few of today’s UTVs have GPS, Trail Tech saw that none come with a standard CVT-belt temperature gauge. So, Trail Tech introduced its TTO CVT temp gauge kit for UTVs, ATVs and snowmobiles. 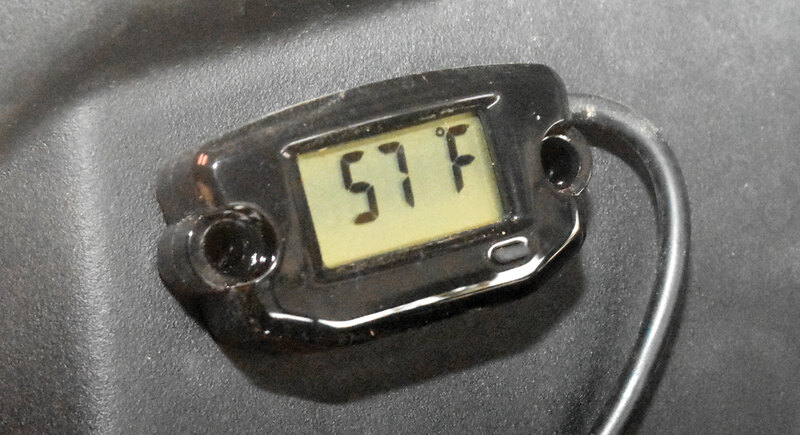 We installed the TTO CVT temp gauge kit on our Polaris RZR XP 1000 Gold Matte LE rock crawler last month to monitor belt temperatures. The tiny digital TTO surface-mount gauge (1.75×1.22×0.7-inch) has a 1.0 x .0.5-inch LCD screen and weighs only 1.3 ounces. One button toggles the gauge between time, temperature (Fahrenheit/Celsius) and maximum temperature, with a range from 30–500 degrees Fahrenheit (0–270 degrees Celsius). The $49.99 kit includes the TTO temp gauge, temperature sensor probe, 120-inch sensor extension loom, two-sided tape surface mount and two plastic screw covers for a clean installation. It doesn’t include two M4 (#6) screws, which you will need if you want a more permanent installation. 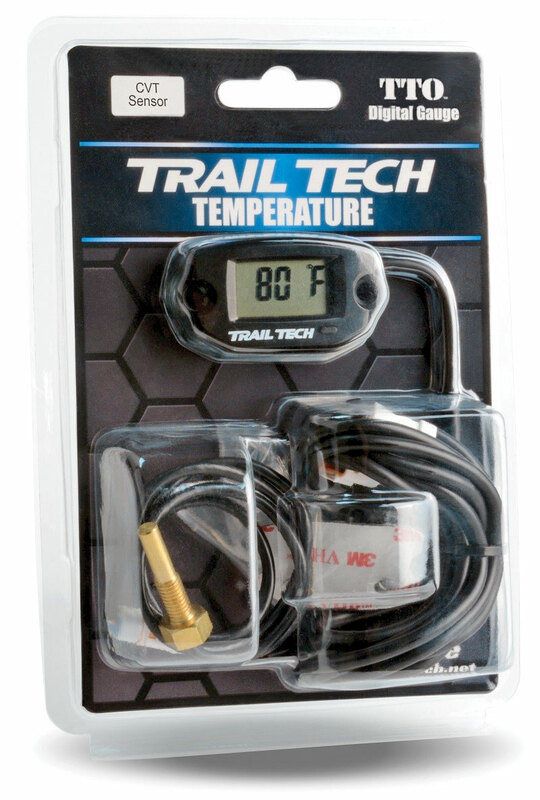 The Trail Tech CVT temperature gauge kit now comes with a 10-foot extension for UTVs, and there are 1-, 2-, 4- and 6-foot extensions for $7.95 to $9.95. The TTO gauge is plastic with an easy-to-view LCD screen and an internal battery with a five-year lifespan. The temperature sensor is a brass probe with M6x1.0 threads and a foot of sensor wire. The 10-foot sensor extension has quick connectors to the gauge and probe, and the TTO CVT temp gauge kit is designed to fit most two-seat UTVs and short-wheelbase four-seat UTVs, such as the Teryx4. Everyone with a belt-driven, two-seat UTV. Owners of four-seat UTVs who want to monitor CVT-belt temperatures will probably have to opt for a 72-inch extension ($9.95). When the gauge shows the belt temperature rising, back off or stop completely to let it cool down and you’ll extend the belt’s life. Since this kit costs about one-fourth the price of a CVT belt, it’ll pay for itself many times over. Trail Tech also has 12-, 24-, and 48-inch extensions for $7.95 and for a cleaner installation. The Trail Tech TTO CVT temp gauge kit is a great asset for extending the life of your CVT belt, and it’s easy to install in a UTV. The price is very reasonable, so there is a lot of bang for the buck, including the joy of driving by other UTVs with blown belts. Most UTVs monitor engine-coolant temperatures only, so the CVT-belt readout adds another dimension of protection. Or, if you’ve installed the Voyager GPS unit ($289.95) on your UTV, you can save money by just buying the $29.95 temperature sensor probe (#V300-001) and wiring it into the Voyager unit (instead of the redundant radiator-hose temp sensor), converting coolant temp readout to CVT-belt temp. Sweet!